MAC Address (Media Access Control Address) - Also known as hardware address or ethernet address, A MAC address is a unique code assigned to most networking hardware. The hardware is assigned a unique number by the manufacturer and the address is permanently assigned to the device. MAC Addresses are in a 48-bit hexidecimal format such as 00:2f:21:c1:11:0a. They are used to uniquely identify a device on a network, and for other functions such as for being authenticated by a DHCP server. MBR (Master Boot Record) - The master boot record is a small program that typically resides on the first sector of a hard drive, and is executed when a computer boots up. The program begins the boot process by looking up the partition table to determine which partition to use for booting. It then transfers program control to the boot sector of that partition, which continues the boot process. In DOS and Windows systems, you can create the MBR with the FDISK /MBR command. MCA - Micro Channel Architecture was a proprietary bus used in early IBM machines as a replacement for ISA. It was slightly superior to EISA and supported Plug-and-Play and bus mastering. Not very many expansion boards were ever made to fit MCA specifications and this technology is no longer manufactured. MD5 (Message Digest 5) - MD5 is a hash function designed by Ron Rivest and widely used in cryptographic applications. is a standard algorithm that takes as input a message of arbitrary length and produces as output a 128-bit fingerprint or message digest of the input. MD5 is an improved version of MD4 which was cracked. Media Converters - simple networking devices that make it possible to connect two dissimilar media types such as twisted pair with fiber optic cabling. They were introduced to the industry nearly two decades ago, and are important in interconnecting fiber optic cabling-based systems with existing copper-based, structured cabling systems. They are also used in MAN access and data transport services to enterprise customers. Fiber media converters support many different data communication protocols including Ethernet, Fast Ethernet, Gigabit Ethernet, T1/E1/J1, DS3/E3, as well as multiple cabling types such as coax, twisted pair, multi-mode and single-mode fiber optics. Media converter types range from small standalone devices and PC card converters to high port-density chassis systems that offer many advanced features for network management. 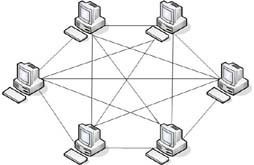 Mesh Topology - A Mesh topology is a network where every device on the network is physically connected to every other device on the network. This provides a great deal of performance and redundancy, however, the cost and difficulty of creating one increases exponantially as the number of nodes on the network increases. There are also partial-mesh networks where some of the nodes are connected to all the others, but others are only connected to nodes with which they exchange the most data. MHZ - Megahertz, or million cycles per second, the common measure for the operating speed of a computer processor or any other electronic component. It denotes how many million times per second the component performs a basic switching operation. MIME (Multipurpose Internet Mail Extensions) - MIME types were created because the SMTP protocol was designed to handle ASCII text only. MIME allows for binary files such as images to be sent via email. Web browsers use MIME to understand how to display non-HTML data within the browser. Servers insert the MIME header at the beginning of any Web transmission. Clients use this header to select an appropriate "player" application for the type of data the header indicates. Minijack - A standard 1/8" jack/plug connector that is commonly used for connecting and trasmitting signal to headphones or other audio components. MOC (Microsoft Official Curriculum) - The official set of training materials and classes provided by Microsoft for their certification exams. Microsoft offers e-learning or MOC courses through their approved training providers. You can find training here. Simplex - Signals can be passed in one direction only. Half Duplex - Half duplex means that signals can be passed in either direction, but not in both simultaneously. Half-duplex modems can work in full-duplex mode. Modems can also be classified by their speed which is measured by the BAUD rate. One baud is one electronic state change per second. Since a single state change can involve more than a single bit of data, the Bits Per Second(BPS) unit of measurement has replaced it as a better expression of data transmission speed. Common modem speeds are V.34 at 28.8 kbps, V.34+ at 33.6 kbps and V.90 at 56 Kbps. Molex - Molex is a manufacturer of electrical connectors. The name is often associated with a type of connector used in desktop computers. It consists of a plastic end to which four wires are attached: 2 ground (black), one 12V (yellow) and one 5V (red). Its connector, when viewed from the mating end, is trapezoidal in shape, to prevent user from plugging it in incorrectly. The Molex power connectors from a power supply are female, and connect to male connectors located on a peripheral. MMF (Multi-mode Fiber) - It is a Fiber optic cable in which the signal or light propagates in multiple modes or paths, and is the most common type of fiber optic cabling used in network installations. This is largely because it is less expensive and easier to work with than SMF. Can suffer from pulse dispersion which may limit the distance that this type of cabling can span. Typically, multi-mode has a larger core diameter than SMF at 62.5 microns, and an outer cladding diameter of 125 microns. MMX - MMX is a SIMD instruction set designed by Intel, introduced in their Pentium MMX microprocessors. MMX processors can handle many common multimedia operations, such as digital signal processing (DSP), that are normally handled by a separate sound or video card. However, only software especially written to call MMX instructions can take advantage of the MMX instruction set. Nobody knows for sure what MMX stands for. 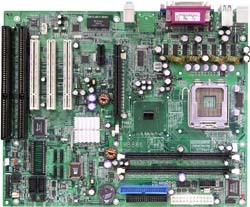 Motherboard - A motherboard (AKA systemboard or mainboard) is the main printed circuit board in a computer that provides ports and expansion slots for connecting the CPU, memory, expansion cards, etc. The motherboard is also responsible for system resources such as IRQs, DMA channels, I/O locations, etc. and houses the system BIOS. MOV - MOV is a digital movie format for video and audio on the web. It is played with Apple's Quicktime. MPEG (Moving Picture Experts Group) - The name of family of standards used for coding audio-visual information (e.g., movies, video, music) in a digital compressed format. The major advantage of MPEG compared to other video and audio coding formats is that MPEG files are much smaller for the same quality. This is because MPEG uses very sophisticated compression techniques. MPEG layer 3 (MP3) is a popular compressed audio format that reduces file size greatly without much loss in quality. MS-CHAP (MicroSoft Challenge Handshake Authentication Protocol) - This is Microsoft's version of CHAP and is a one-way encrypted password, mutual authentication process used in Windows operating systems. Like the standard version of CHAP, MS-CHAP is used for PPP authentication, but is considered by some to be more secure. MS-CHAPv2 was released to solve many of the problems and deficiencies of the first version. MySQL - MySQL (pronounced "My Ess Queue Ell") is a multi-threaded, multi-user, open source relational database management system (RDBMS) that uses Structured Query Language (SQL). Because it is open source under the GNU General Public License, anyone can download MySQL and tailor it to their needs in accordance with the general public license. MySQL is noted mainly for its speed, reliability, and flexibility. Although most commonly used in Linux environments with PHP, MySQL has been ported to a wide variety of platforms including Windows.